For the longest time now, everyday when I opened my makeup drawer to put on some makeup and get ready for the day, I was greeted with a mess! Not a great way to start the morning. I’d see overturned eyeshadows, pencils strewn all over, pencil shavings everywhere, and old makeup that needed to be tossed. I kept saying to myself, “I really need to clean out and organize this drawer” but I never got around to it. I knew it would make getting ready that much nicer if the drawer was organized, so I finally tackled it last weekend. 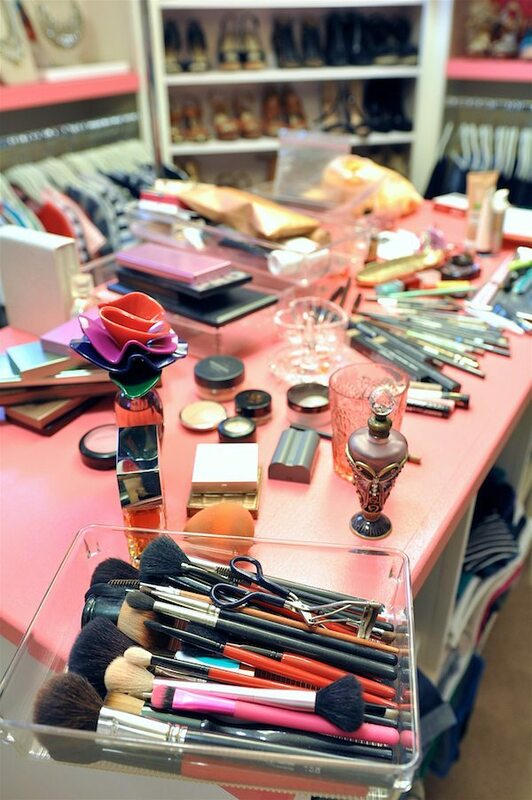 Avert your eyes to the ugly before (but true) before makeup drawer. I must say, even though the makeup drawer was a disaster, I love having a built-in dresser in my closet and room to get ready in there. I spent a good bit of time designing the closet layout, so there’s no excuse not to keep it tidy, since there’s a place for everything. Of course, a truly fresh start begins with taking everything out of the drawer, sorting, organizing, and tossing what’s old or broken. 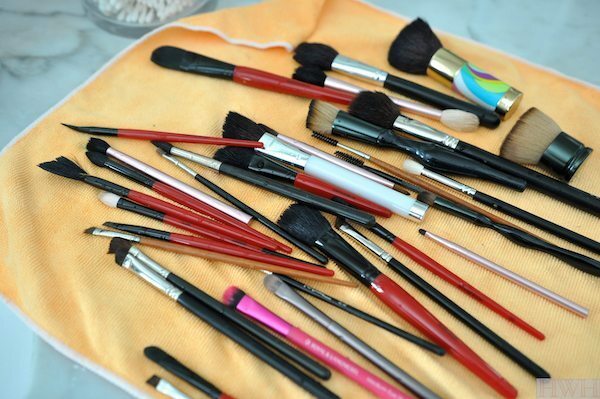 I even got ambitious and washed all my makeup brushes using this brush-washing tutorial. 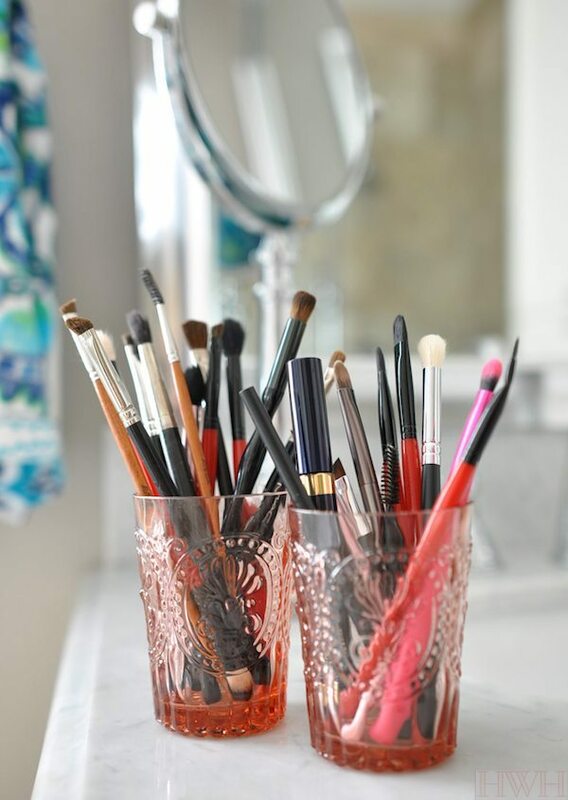 I always store the small brushes I use most often upright in small glasses that I keep on top of the dresser. It makes them easier to see and reach for and keeps the bristles from getting mangled in the drawer. And I washed all the drawer dividers in the kitchen sink with warm, soapy water. Those things were filthy dirty! But all better now! After putting the things I wanted to keep back in their proper places, the drawer felt so much better! THIS is what I’d rather see when I go to get ready each morning! Before I buy any more makeup, I had to get that drawer in order. Now, with all the old items discarded, I could see what I have and make room for a few new things to try. Lancome is offering a free gift with purchase when you spend $39.50, and the gift is up to a $130 value. I’m a fan of the gift with purchase when the gift is something I end up actually liking and using! The gifts offered by Lancome include their awesome eye makeup remover and High Definition mascara, two items alone worth having in your arsenal of beauty products. But the gift also includes skin care, eye shadow palette and brush, and a cute makeup bag. Check it out here. 1 || Comforting Rehydrating Toner – My dermatologist recommended I start using a toner for my skin and I want to try this one after reading the reviews. Women love it! 2 || Waterproof Undereye Concealer – Maybe this will help disguise those dark circles that are forming in conjunction with those sleepless nights. 3 || Color Design Lipcolor – I’m all for a bright lip color for Spring. This one in “Racy” is the perfect accompaniment to brighten up your Spring outfit. If you’ve been shy about a bold lip color, just try it! Keep your eye makeup more neutral to balance it out. 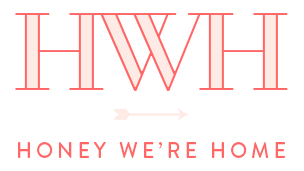 4 || Juicy Tube Lipgloss – I swear by this lipgloss. 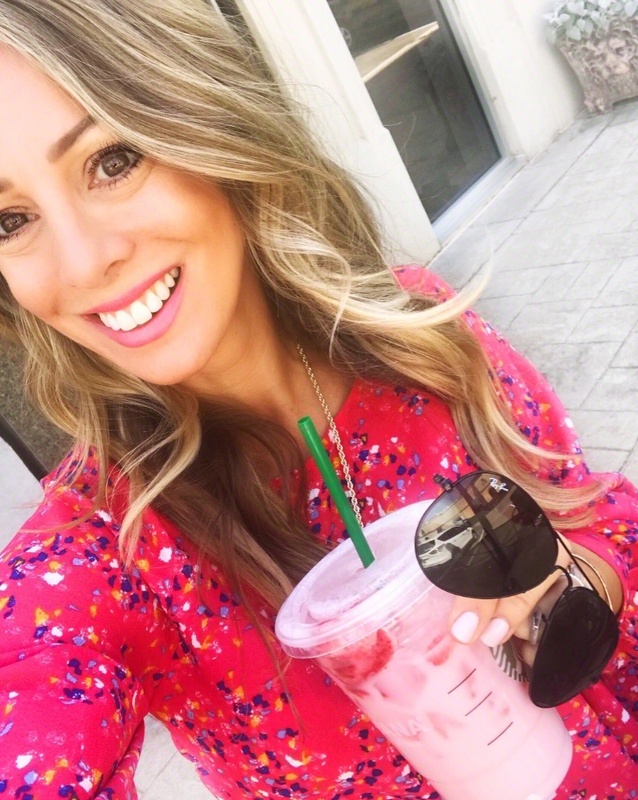 I’ve tried it in nearly every color and wear it alone or over lipstick for a glossier look. 5 || Mattifying Silky Pressed Powder – Pressed power like this typically takes the place of liquid foundation for me. It gives your face a smooth complexion and matte finish without the heavy feeling that liquid foundation can leave. 6 || Brow Groomer & High Definition Mascara (not pictured) – Brows are such an important part of making up your face. This one will help hold your brows perfectly in place with or without brow pencil. And, if I could only wear one item of makeup, it would definitely be mascara. This one has the type of mascara brush I love that gives your lashes a super full, lush look. 7 || Self Tanning Gel – If you’re like me, months of winter and being all covered up have left you super pale. Self tanning gel to the rescue! This one is specifically for your legs and I read all the reviews, and they say it’s pricey, but worth it because it looks natural (not orange), goes on without streaking, and has a nice scent. I definitely need this! 8 || Eyeshadow Palette – All the colors you really need in one palette without too much shimmer. Great for day or night looks and you can get the flat end of the eye shadow brush wet to give you more intense color. 9 || Tory Burch Makeup Case – Such a cute makeup case for Spring! 10 || Limited Edition Brush Set – Good makeup brushes make all the difference in applying makeup well. This set includes a foundation brush, powder brush, angle shadow brush, and a liner and shadow brush and comes with the travel case. 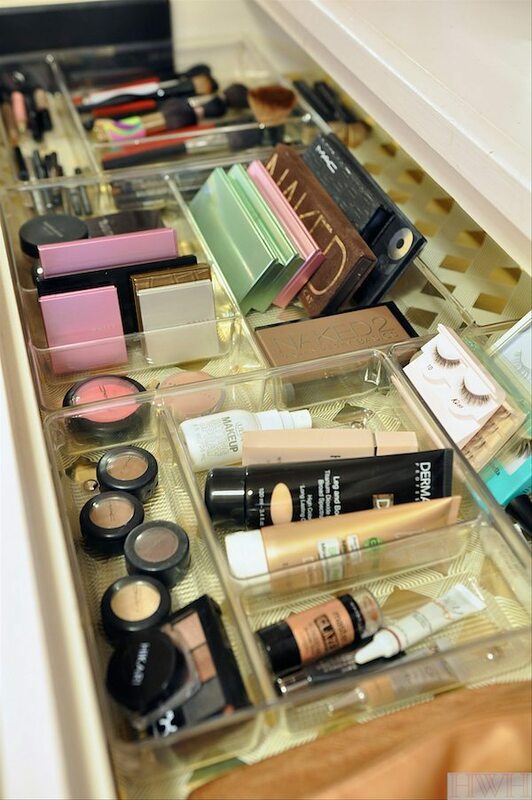 Have you organized your makeup lately? 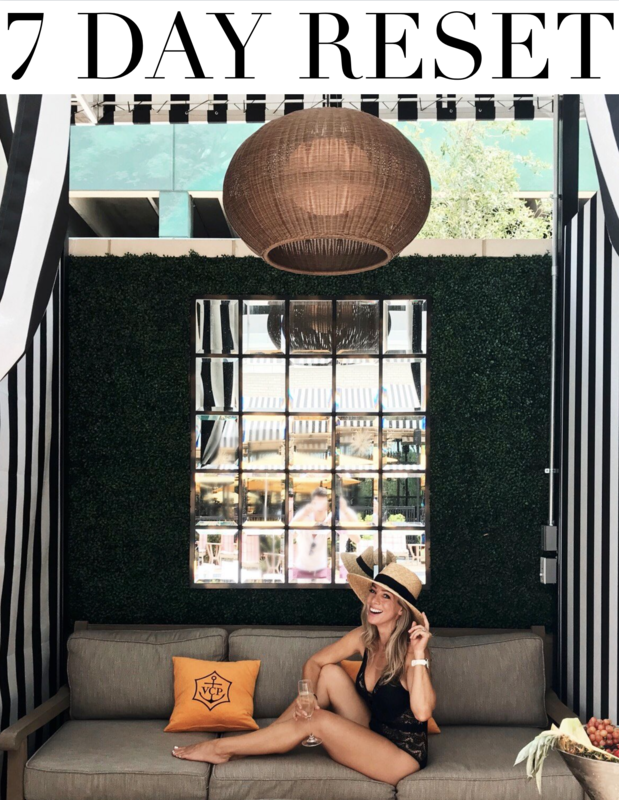 Thanks to Nordstrom for partnering on today’s post. My best tip? I keep my eyeliner sharpener in a snack size ziplock. When I sharpen eyeliner or lip liner, I do it in the bag. All the shavings are contained in the bag with the sharpener. Prevents the messy shavings all over the drawer. Your tip might seriously change my life! Thanks for sharing that! I hate all those pencil shaving everywhere! I don't have a huge amount of make-up so that's how I keep things tidy!! Where are your drawer organizers from? I think I have a project for today! ? Will feel good to get organized! Those clear drawer organizers are from The Container Store and I think I got some at Homegoods! 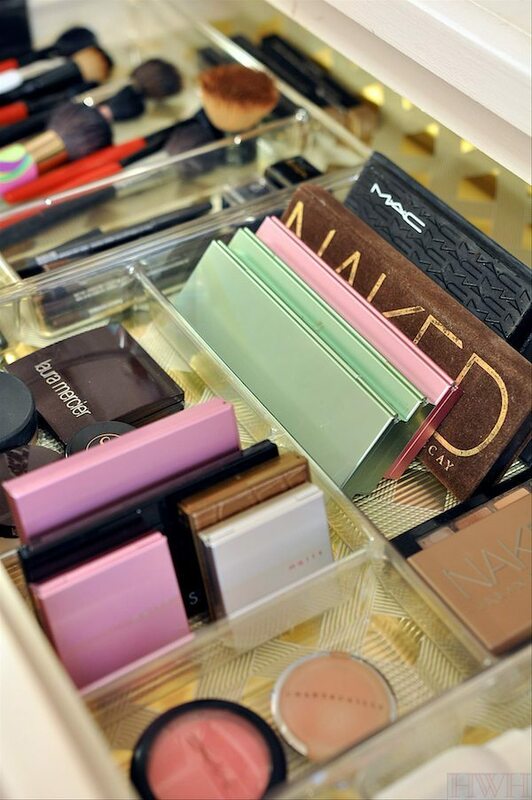 Love an organized makeup drawer. The game changer for me, using a plastic ice cube tray for mac shadows, lipstick tubes and gloss!! 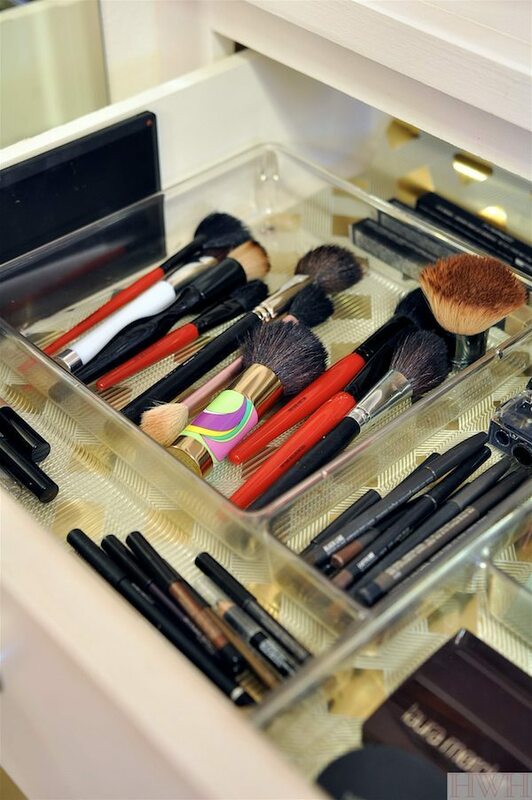 I suddenly have the urge to organize my make up and buy more brushes……. I always feel like organizing when I read good organizing posts! 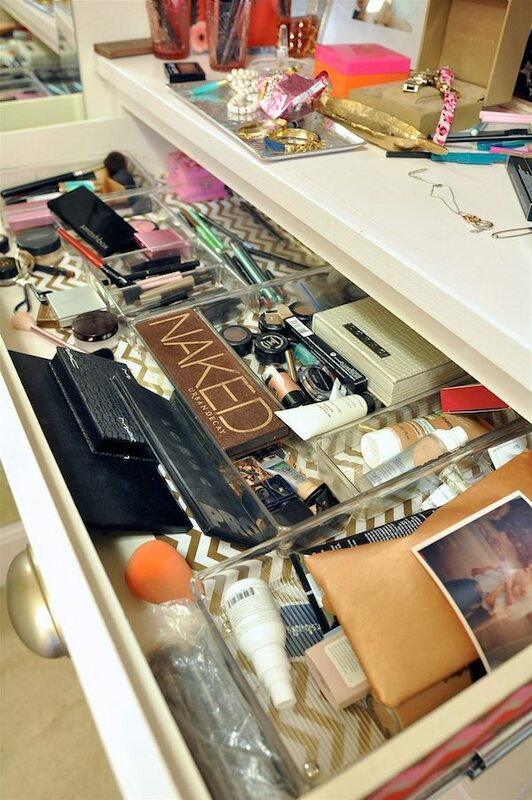 I like having the make up all spread out in a drawer where I can see everything. It makes getting ready in the morning much easier! Clarins non-alcohol toner is perfection! Good to know! Thanks girlie! 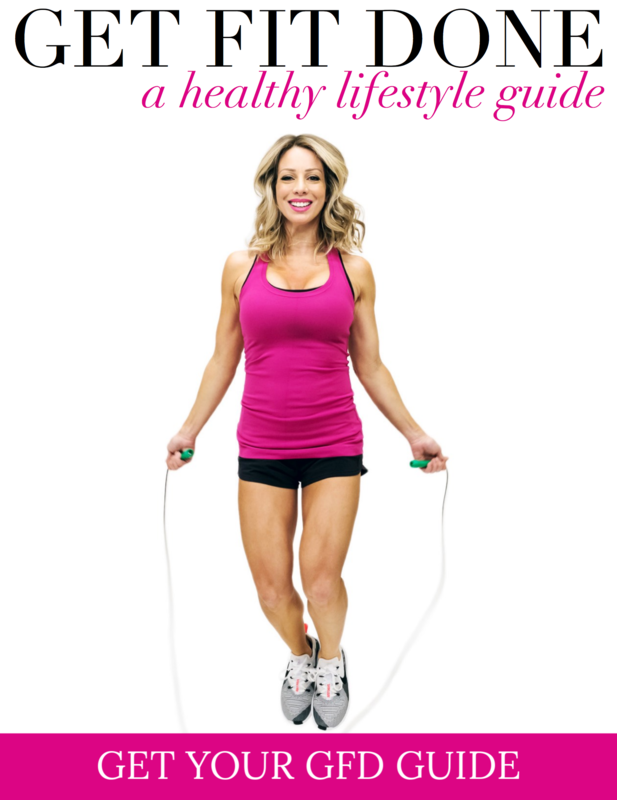 For someone who is 35 (ack!) and knows nothing about hair or makeup but wants to start feeling better about myself (plus I'm now mom to a 2 yr old and 2 month old girls), where do you recommend I try? 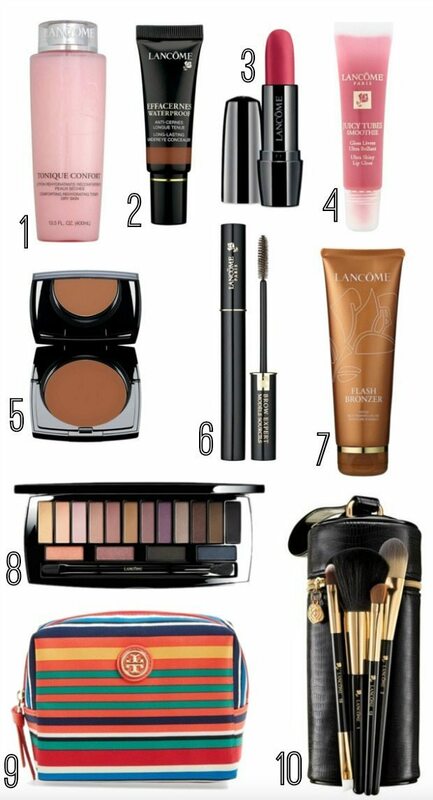 Do you like one makeup counter better than another to learn? I'm thinking going to the department store counters. Well Jennifer! You must be so busy! But even a five-minute make up application in the morning will help you feel so much more put together! Any high-end department store like Nordstrom will have good make up counters for you to try. Just be honest with the person about your lifestyle and what's reasonable for you to do each day. And you don't buy everything they recommend, maybe just start with a couple of products. And have fun with that! I try to clean my little acrylic 3 drawer set monthly. i keep mine organized in the order input it on… Top drawer has primers and powder foundation, next eyes and bottom drawer blush, lip stick and setting powder. Man, it's probably been, well I don't even know how long since I cleaned those drawer dividers! It's always so motivating to get organized, especially when the rest of life might feel a little crazy! Question about foundation –you mentioned using a pressed powder in place of a liquid foundation. Which powders do you prefer? When you do use a liquid foundation, what do you prefer? Do you use a primer? Your finish always looks beautifully matte and flawless. Thanks in advance –enjoy your beautiful family! I don't use a primer, and since I don't often use foundation, I don't want to spend a lot and have just used foundation from the drugstore. Thanks so much for the compliment! !